To which my Mom replied that we had a similar thing going in the USSR. While I am too young to remember the real drills and civil defense exercises outside of our Beginning Military Training class in school, I wasn’t above wearing a gas mask on a bet. This Soviet training movie, lovingly translated and captioned by me, tells the story in the most rosy of ways. In reality, just like any activity that was mandated from the top, the Soviet people didn’t take this training seriously (think modern corporate sensitivity training) and used it as an opportunity to enjoy a break from their workplace. It took me days to translate this video, watching it is mandatory, there may be a quiz at the end. On the American side of things, the Life Magazine dedicated a September 15, 1961 issue to the discussion and detailed plans for building a variety of fallout shelters and survival tips in case of the nuclear war. The section is prefaced with the letter from the President Kennedy urging the Americans to prepare for having to survive a nuclear war. 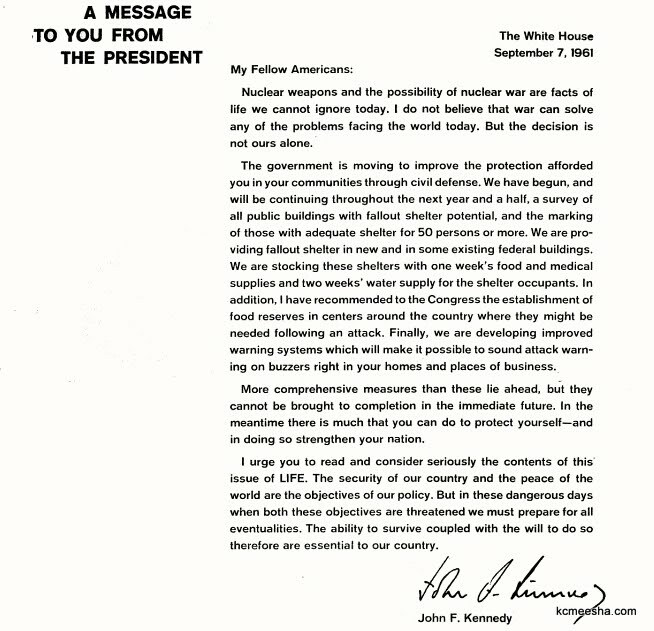 Letter from President Kennedy about the importance of preparing for the nuclear war. The man down the street with a backyard shelter was considered odd. But he is actually a solid, sensible man – and a responsible citizen. So there still may be a chance for you, Ron Paul voters. Probably not. And now some photos of various shelters. If you have an access to an abandoned Cold War shelter, I would be grateful for an opportunity to take a few photos (and buy you a drink).